CNN International’s Hala Gorani couldn’t fathom why a Palestinian terrorist organization wasn’t invited to the upcoming Middle East peace conference in Annapolis, Maryland. Following-up to an answer made by State Department spokesman Michael Pelletier during an interview, Gorani exclaimed, "How can you have a Middle East peace summit that doesn’t include Hamas? Forget whether or not you don’t like them as a group, or call them terrorists. How can you not?" 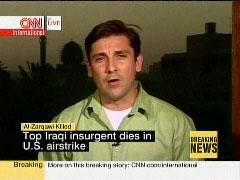 Gorani asked the question 18 minutes into the 12 pm "Your World Today" program on Monday, which is simulcast on CNN. Gorani began the interview on a bit of a skeptical, even hostile note, and she acted as if she should be the one directing the negotiations. After her initial question and the answer from Pelletier, Gorani shot back with the following point. "You have two very weak leaders. The Palestinian isn't even representative of his entire population. Ehud Olmert is the least popular Israeli prime minister, practically, in history. George Bush won't be in office in 13 months' time. Why would anything come out of this?" Video clip (1:24): Real (2.28 MB) and Windows (2.58 MB), plus MP3 audio (652 kB). CNN viewers on Friday saw a relatively rare acknowledgement of those who are skeptical of Al Gore's film "An Inconvenient Truth," including a British judge who recently ruled that there are nine inaccuracies in the movie. But CNN's Miles O'Brien dismissed the views of dissenters, and downplayed the importance of the errors cited by the judge. 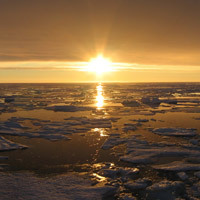 Assume for a moment that a new study by NASA proved beyond a shadow of a doubt that manmade global warming was indeed responsible for the recent ice melts in the Arctic. Think media would have reported it? In reality, that's a bit of a trick question, for in the past several weeks, television newscasts, papers, and magazines have been filled with hysterical assertions about decreasing Arctic ice levels destined to cause imminent flooding to coastal regions around the world. As such, it certainly was no surprise when NASA released a report Monday claiming "the rapid decline in winter perennial ice the past two years was caused by unusual winds," virtually no media outlets shared the information with the citizenry, and those that did still blamed the melting ice on - you guessed it - global warming. "Recruiting the next generation of militants. A Mickey Mouse-like character reaches out to Palestinian children." Surely, CNN doesn’t stand for Communist News Network. But CNN’s Soledad O’Brien went looking for the "grass roots" of the pro-illegal immigration movement in Chicago during Tuesday’s Your World Today at mid-day. 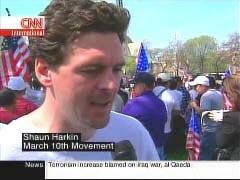 She interviewed a man she described as "Shaun Harkin of the March 10th Movement." She did not describe him with ideological precision: he’s a fervent Leninist. Books, not bombs? Like a golden oldie from the Reagan Eighties, CNN’s Tom Foreman forwarded the classic liberal claim on Monday’s (noon Eastern) "Your World Today" show that the Iraq war is so costly that it could have been better spent on hundreds of grade schools or millions of new teachers, new cargo inspectors, and new cops -- or "every American driver could get free gasoline for a year." Hala Gorani: "Well, Human Rights Watch says detaining hundreds of men without charge at Guantanamo has been a legal and political debacle of historic proportions. But what can human rights groups do to shut the facility down or put pressure on governments? Human Rights Watch executive director Ken Roth joins us now live from Washington. That was a quote from you, ‘a legal and political debacle of historic proportions,’ Ken. Did you imagine in 2001, that in 2007 Guantanamo Bay would still be operating?" Church: "And a completely different view. Soh, from Singapore writes: ‘The North Koreans have done the right thing. Since the end of the Korean War, they have been subjected to hostilities from the United States. and other western powers. This bomb is a source of tremendous pride for the Korean people, north and south. The world should congratulate the North Korean people for this achievement." One can imagine a 1930s CNN reading German e-mails congratulating Hitler on his triumphant liberation of Poland. NewsBusters contributor Jack Engelhard incorrectly thought he received an email from CNN anchor Jim Clancy. This did not occur. 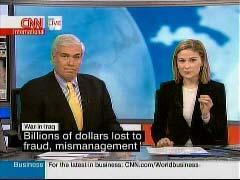 NewsBusters retracts this story and apologizes to CNN and to Jim Clancy for this false assertion.